A group of automotive researchers from the U.S. Department of Energy's (DOE) Argonne National Laboratory and industry have shown that a fuel-injected racing car engine fueled by E-85, an ethanol-based fuel, outperforms the same engine with a carburetor and leaded racing fuel. Specifically, the group, dubbed Project Green, demonstrated during benchmark testing a seven percent improvement in the torque and speed of a General Motors' CT525 LS3 fuel-injected engine with a catalytic convertor attached to the exhaust system and renewable E-85 in the fuel tank, said Forrest Jehlik, principal mechanical engineer at Argonne's Center for Transportation Technology. The General Motors engine is a popular choice among circle track racers. "The testing disproves two widely and firmly held beliefs in the circle track racing community – that carbureted engines are inherently more powerful than engines equipped with a fuel injection system; and that E-85, which is less expensive than leaded racing fuel, is not well-suited as a fuel for race cars," said Jehlik, who leads the benchmark testing for Project Green. Aside from the garages of classic and vintage car collectors, race tracks are about the only venues these days where engines with carburetors are in active use. Fuel injection systems began replacing carburetors in earnest in the early 1980s because they allow for greater fuel efficiency as a result of precise and even fuel distribution to each cylinder. Moreover, tailpipe emissions from cars with fuel injection engines are lowered due to the precise metering of fuel, thereby reducing the amount of oxides of nitrogen, hydrocarbon and carbon monoxide combustion byproducts. Catalytic convertors, which further reduce the amount of emissions generated by internal combustion engines, are not normally part of the exhaust systems of racing cars. But Project Green's dynamometer testing of the GM engine utilizing catalytic convertors resulted in a 50 percent to 60 percent decrease in nitrogen oxide, one of the main ingredients involved in the formation of ground-level ozone. However, there was not an appreciable decrease in carbon monoxide and hydrocarbon emissions. After analyzing the test data to determine why the decrease was so slight, the team developed a secondary air-injection system that will increase the level of oxygen in the exhaust stream and thereby allow oxidation of those by-products. Results from on-track testing set for the week of July 12th at the New Smyrna Speedway in New Smyrna Beach, Fla., are expected to validate that new approach. 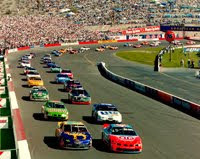 Professional circle track racing series have been reluctant to require racing teams to use today's cleaner and more efficient automotive technologies and fuels in their vehicles. But Project Green is optimistic that these technologies will eventually be adopted by the sport, just as the American Le Mans Series' Green Challenge has adopted green racing principles established by DOE, the U.S. Environmental Protection Agency and the Society of Automotive Engineers. "If you start getting the racing community to see that cars can run just as fast and more efficiently with fuel-injected engines and domestically produced biofuels that are more environmentally friendly and less expensive, it has the potential to really catch on with race car drivers and their large fan base," Jehlik said. "The bottom line is that we have shown that modern fuel-injection technology, renewable E-85 fuel and catalytic convertors provide better performance and increased efficiency while reducing emissions; it is a reality today. Truly, there are no compromises. It’s a win-win for everyone, and we believe it is the future of racing and a step towards sustainability in the transportation fuels we use as a country."